Things often never go to plan, which is why we were late leaving Dublin and why we subsequently found ourselves deep in the Tipperary countryside stuck behind a tractor with a trailer-full of round bales. As a farmer's daughter, the "stuck behind a tractor" is a story I've used many times to explain tardiness, but this time I wasn't trying to dodge my mother's ire. Instead, we were trying to arrive in time for dinner at the Old Convent in Clogheen. Snuggled is a very cute word, not one I use too often, but I really can't think of a better way to describe the closeness of the Old Convent to the Knockmealdown Mountains. The austere lifestyle of the Sisters of Mercy has given way to a gourmet retreat, under the ownership of Dermot and Christine Gannon. From the minute that you set foot on the classic black and white tiled floor, everything has been thought of. The individual bedrooms are beautifully decorated, and unoccupied rooms are left open for a sneak peek. In fact, there's even a treat room, stocked with teas, coffees, snacks, toiletries, books and DVDs. 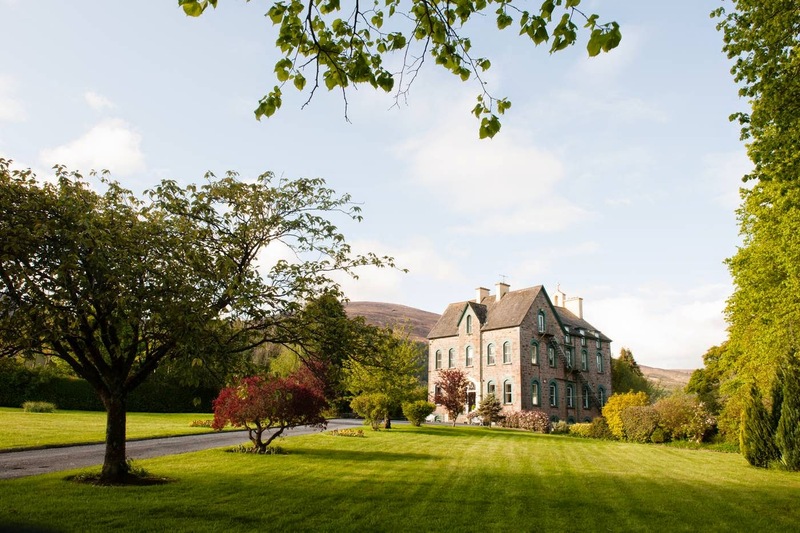 We were staying overnight on a Hideaway Summer Special, which included an overnight B&B stay plus an 8 course artisan Irish tasting dinner for €250. After a quick refresh upstairs, we descended for a pre-dinner drink and a chance to relax. Thanks to an earlier wine tasting, there were more wines available by the glass than usual, giving us a little extra to choose from. One by one, the various couples were taken into the dining room, which was the former chapel of the convent, and still has several stained glass windows. We would be dining from the Chef's tasting menu, normally costing €65 per head. Our meal started with a picture perfect glass of Connemara smokehouse salmon tartare topped with bright Goatsbridge trout caviar and edible flowers. The use of vividly coloured flowers continued throughout the meal, adding a touch of whimsy and prettiness. The Crowe Brothers rare breed pork dish could have done without the heavily spiced pear but otherwise was a masterclass in how to cook pork. The cleansing lemongrass sorbet was one of the best courses I've ever enjoyed, intensified by the pineapple pickle and crunchy black sesame seeds. Nenagh Hereford beef was simply superb, barely requiring a steak knife. I ventured on with a sharp lemon curd, but I eventually admitted defeat with the exquisitely rich cacao pot. Afterwards, we ventured out into the beautiful grounds for an evening walk to cool ourselves down and start the digestion. It never really gets dark in the country during the summer months, and we could still see the dark shapes of the Knockmealdown mountains watching over us. To the rear of the house, the chickens were cooped up for the night, hopefully safe from neighbourhood foxes and minks. We slept with all windows open in an effort to keep some cool air moving through our bedroom, and we awoke to the delighted crows of the cockerel. The usual eating rules don't apply when away from home, so I was looking forward to a generous breakfast, despite still feeling pretty full. And the breakfast experience definitely didn't disappoint. Fresh granola, yogurt and local apple juice started us off, while we waited for our cooked breakfasts. We had both chosen the boar breakfast, a variation on the Full Irish which uses local boar-based products, with the sausages deserving particular praise for being juicy and succulent. A plate of toasted farmhouse breads would have provided enough sustenance to see a man clear through to evening, but the overkill came in the form of a little sampler of buttermilk pancakes. These were airily light, capable of flying out through the window, topped with strawberries and lemon. The sunshine of the previous day had disappeared behind grey clouds and occasional rain, but that didn't stop us from taking another walk around the grounds. This time the chickens were out in their run, strutting their stuff and occasionally dropping an egg. A trio of rescue donkeys live in a paddock towards the rear, and Christine was keeping an eye on the pregnant females, who were all expecting at the same time thanks to the adventures of a randy rescue male donkey. The Old Convent is a perfect little oasis, suitable for a restful weekend or a romantic interlude. Dermot is a chef who passionately cooks with the finest of local and Irish ingredients, while Christine is an attentive and considerate hostess. This lovely couple have crafted something really special and they transfer that passion to their guests. I've heard that it can be hard to get a reservation at The Old Convent, and now I understand why. A perfect gourmet hideaway. Beautiful photos. This is one of my favourite places. I enjoyed reading your review. This sound likes a great place for a break away! It's been a few years since I was there, but it's an incredible place, a real gourmet hideaway as you say. You've just made me want to go back!